What’s that expression about cleaning with kids at home? “Cleaning with kids in the house is like brushing your teeth while eating Oreos.” Do you feel that way? I do! Unfortunately, I can’t wait for the kids to move out before I clean again. I also don’t love buying expensive cleaning supplies that are probably not good for our health or the environment. I’ve wondered if there’s an alternative. Norwex products seem great, but like most MLM items, their prices are outrageous. Thankfully, there are a lot of great MUCH CHEAPER alternatives to Norwex! Norwex is an MLM (multi-level marketing) company that sells products for natural, chemical-free cleaning. Their most popular item is the Enviro Cloth, which is a general-purpose microfiber cloth. The items are only sold through consultants, usually at home sales parties. I believe the Norwex items are quality products. If you’ve read my blog for a while, you already know that I think you should avoid home sales parties if you want to protect your budget. Like most MLM products, I think Norwex products are greatly overpriced. Is Norwex a scam? No, I don’t think it’s a scam, but I do think it’s way too expensive! Should I Become a Norwex Consultant? If you’re considering becoming a Norwex consultant, please check out my post about why joining an MLM will not solve your financial problems first. Do Norwex Cloths Kill Germs? You may have heard that the silver in Norwex cloths makes them “self-cleaning”. Some people even claim that you can wipe up something covered in germs and then just continue cleaning. Or a quick rinse is all that’s needed to wash away all the germs. Is this true? 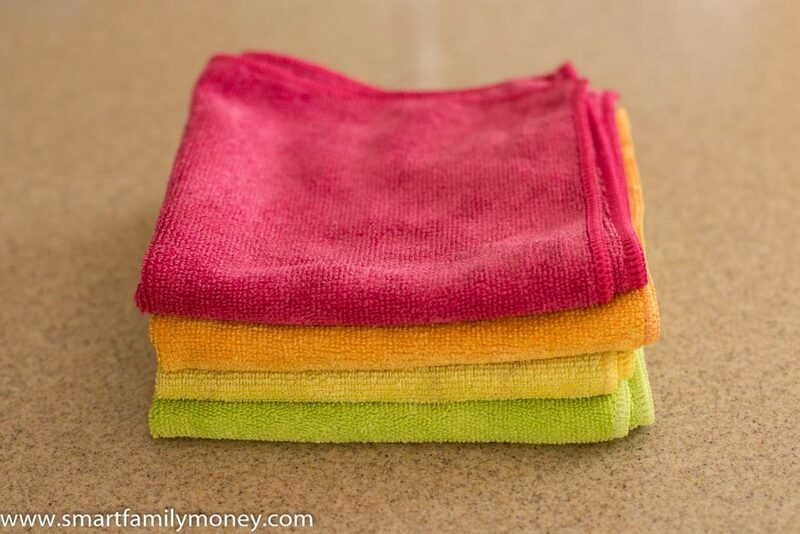 Norwex and similar high-quality microfiber cloths do a great job of picking up bacteria. If they’re only slightly dirty, they don’t transfer many of the germs back onto a surface. This means it’s ok to use them to clean up little kitchen messes with the same cloth throughout the day. The bacteria gets stuck in the cloth and doesn’t get rubbed back onto surfaces. Once bacteria are in the cloth, Norwex cloths do no better job killing germs than any other kind of cloth, including a basic cotton washcloth. They are definitely NOT “self-cleaning”. Simply rinsing the cloth does not remove all the bacteria. Even washing it in a washing machine doesn’t. The only way to completely sanitize the cloth is to boil for 10 minutes. Bottom line: High-quality microfiber cloths can do a great job of cleaning, but there is nothing magical about Norwex cloths. Microfiber can pick up bacteria, but it doesn’t kill the germs. If you’d like to try some high-quality microfiber cloths, there are certainly less expensive options than the $17.99 Norwex Enviro Cloths. I’ve read a number of comparisons and reviews that state that E-Cloths are nearly identical to Norwex Enviro Cloths. The various specialty cloths that each company offers have pros and cons, but the quality is virtually identical. The only difference is that Norwex cloths have silver in them and E-Cloths do not. Since the silver is there to act as a germ-killer and we know that Norwex cloths do not actually kill germs better than any other kind of cloth (*see above*), there is no need for the silver. I bought some E-Clothes myself and I LOVED THEM! They clean very well. They are very high quality and I was amazed at what I could clean with just water. I love my new E-Cloth multi-purpose cloths! If you want to give E-Cloths a try, Amazon is an official seller. The starter 5-pack comes with 4 multi-purpose cloths and 1 glass cloth and works out to be about one-third the price of Norwex cloths. Is E-Cloth a Norwex Knock-Off? No, E-Cloth is not a Norwex knock-off. The two companies were founded around the same time, in the mid-1990’s. E-Cloth is sold in retail stores and is popular in Europe. Norwex sells a very similar product through the MLM (multi-level marketing) system instead of retail stores. Just because the products are very similar does not mean that E-Cloth is a Norwex knock-off. If you REALLY want a cloth with silver in it, UberGreen cloths have silver. The reviews indicate that they’re lower in quality compared to Norwex, though. For that reason, I’d personally go with E-Cloth instead. Norwex offers a dusting mitt for $19.49 and E-cloth has a comparable dusting glove that is similar in price. E-cloth does offer a lower cost dusting cloth that might be a good alternative for a MUCH lower price. Personally, I have the OXO Good Grips Microfiber Hand Duster and I LOVE IT. I have a dust allergy, so the process of dusting was pretty miserable for me. With the OXO duster, I can pick up all the dust quickly without spreading it around the room (or into my nose!). The OXO Good Grips Microfiber Hand Duster seems very similar to the Norwex Enviro Wand, but the OXO is 1/3 the cost. I haven’t tried the Norwex wand, but I seriously doubt it is 3x better! The OXO duster is great! Cleaning windows to a streak-free shine with no chemicals or paper towels sounds great, right? But for $19.99?! That’s just crazy. E-cloth offers a comparable product for about one-quarter of the price. I bought an E-Cloth window cloth to try myself. A friend lent me her Norwex window cloth so I could compare. They both work really well, but they are a different style of fabric. The E-Cloth window cloth is very thin and the Norwex window cloth is a thicker fabric. I preferred the thinner E-Cloth because it was easier to get into all the corners of my mirrors and windows. If you’d like to try the E-Cloth window cloth, you can buy one with the starter kit, in a set with a window cleaning cloth, or by itself. At first, I didn’t think the waffle-weave window washing cloth that comes in the window cleaning set (waffle weave cloth & polishing cloth) was worth the extra cost. After some time, I grew to really love it. If you’d like to save some cost, you could skip the window cleaning kit and just go with the starter kit (4 general purpose cloths & one polishing cloth). Over time, I did discover that I needed additional polishing cloths. When you’re washing a bunch of mirrors or windows, the polishing cloth will get wet and then be useless. It’s convenient to have another to swap it out with so I would recommend ordering extra polishing cloths if you can. The Norwex mop system is similar in style to Swiffer mops, but with reusable microfiber pads instead of disposable pads. Many people love the mops but don’t love the price of over $100. Once again, E-cloth offers a nearly identical product for about 1/3 the price. There are also other brands available in the same price range. They’re all interchangeable with Norwex pads too, so you can mix and match if you already have some Norwex items. Norwex sells wool dryer balls for $29.99 for a set of 3. I’m a big fan of dryer balls, as they help reduce drying time (and save energy). They also help to soften and remove static from clothes without fabric softener. Compared to fabric softener they’re better for your skin, better for the environment (less waste and less energy), and less expensive. What’s not to like? But $29.99 for 3 dryer balls is INSANE. I have Woolzies brand, which cost about 1/3 the price of Norwex per dryer ball. There are also many choices on Amazon for even less than that. I know that many readers are searching for cheaper alternatives to Norwex laundry detergent. Personally, I use and love Ecos all-natural laundry detergent. It has all-natural ingredients and is environmentally friendly. It’s also about half the cost of Norwex laundry detergent. I feel like it also does a great job getting out clothes clean! I’m not alone in loving it – check out all the great reviews on Amazon! I do also use this detergent to wash my e-cloths and they’ve held up very well. I LOVE my E-Cloths! I didn’t expect to like them this much, but I’m totally convinced! The window cloth is amazing on windows, mirrors, and shiny surfaces. The multi-purpose cloths do such a great job of cleaning all kinds of surfaces. My kitchen faucet is cleaner than it’s ever been. The cloth even cleaned my stained Corian sink as well as a magic eraser. When I first got them, I had so much fun walking around the house trying them out on different surfaces. As I mentioned above, I eventually ordered extra polishing cloths. If they get wet while cleaning, they become useless and you need to swap them out. I am constantly telling friends about e-cloths. It feels good that I’m not wasting money on unnecessary and unhealthy cleaning products and my house is sparkling! If you’re looking for other healthy non-disposable cleaning options, be sure to check out my post reviewing Swedish dishcloths. You can also find more money-saving ideas in other cheaper alternatives posts. You may enjoy this post about cheaper alternatives to Young Living & Doterra essential oils. 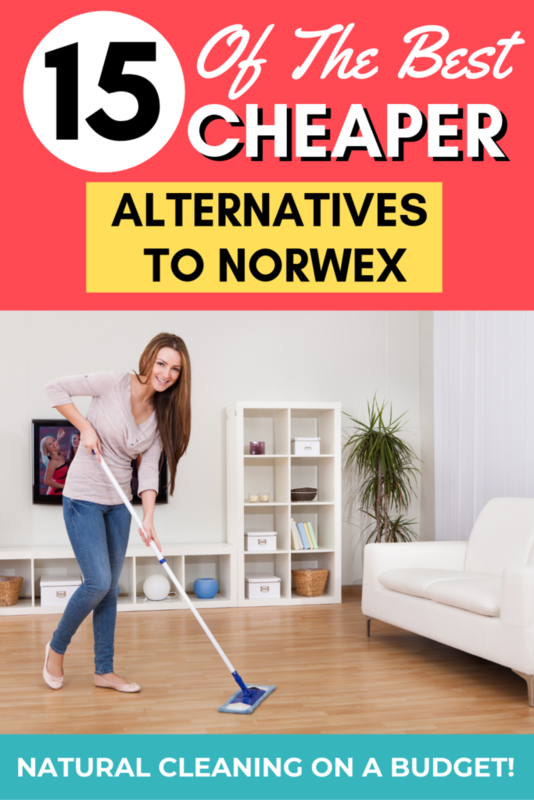 Have you tried any of the cheaper Norwex alternatives? I’d love to hear your thoughts below! I have a mix of cleaning cloths but not because any are better than the others. I started off by getting some from a party with Norwex (I hosted), so I ended up with a ton for free (though I did buy a few things too). I liked the cloths so much that I went hunting for more. I used to cloth diaper and as anyone who has cloth diapered recently (in the last 10 years) can tell you, prints and colors are addictive. I found ecloth and bought some of their stuff, love it too of course, but that wasn’t enough. So I ended up finding the super cute prints in the cheap section at Target one season. They’re thinner and softer, and probably not as good, but they’re good for polishing stainless steel appliances, so that’s what I use them for (eCloth’s stainless steel cloth doesn’t work for me for some reason). Then we started camping and I wanted a set in my camper, and found Buff brand from Microfiber Wholesale. They’re thick and super nice. I buy a dozen of them for about $11. So I’m on the hunt for more because…cloth addiction is real. ? Thanks for the thoughts! Sounds like you have found a bunch of good ones. Thanks so much for doing the research and sharing this wonderful information that help us all who are interested Save Money! Thanks You!!!!! Glad I could help, Nicole! I’d love to hear your thoughts after you’ve used the e-cloth for six (or ten) years — how it holds up, etc. Thanks for your info. (BTW, my understanding is that Norwex doesn’t claim to kill germs–it removes them, just as the e-cloth does; it’s the nature of microfiber — the main difference is that the e-cloth has 1200 miles of fiber and the Norwex cloth has 1890 miles — 50% more microfiber, meaning it’s denser for more cleaning and denser to likely last significantly longer.) But the e-cloth is a super alternative to chemical-based cleaning! I have been using the ecloths for a few months and love them so far! I will update you in a few years. ? For me other great thing about Norwex is that they have a 60-day money-back guarantee and all of them microfiber has a two year warranty! A warranty isn’t worth 3 times the price to me. ? And ecloths also have a money back guarantee. I’ll be honest, I’m an independent Norwex consultant and I had a hard time swallowing the Norwex price point in the beginning of my Norwex journey. I’m a very thrifty person and I hate sales parties (at least I did before Norwex came along). But I’ve come to realize that the extra cost of the Norwex cloths is what pays the consultant to share the good news of being able to clean using only water. Without sales consultants, very few people would know about a healthy and cheaper (in the long run) alternative to harsh chemicals. How many Clorox junkies are going to trust the e-cloth to clean up messes from raw meat just because the packaging says so? But, get a Norwex consultant to do the raw chicken demo with medical grade protein testers, and you get believers left and right! (There is a difference in the quality as well, but that’s another topic best left to the users to compare.) All that to say, the extra cost pays for the ability of Norwex to educate people on making healthier choices for their families and our planet. I can understand that perspective, but my family has to do what’s best for us. A high-quality, less expensive product makes it easier for us to stick to our budget. It’s hard for me to get around the fact that you’re getting a kickback for your positive reviews of products other than Norwex. I imagine if Norwex allowed you to profit from recommending their products, you might have a different story to tell. I’ve tried many of these alternatives and they don’t hold a candle to the quality nd effectiveness of Norwex products, not even close! You are correct that I get a commission from items I link to on Amazon… But Norwex products are also sold on Amazon and I could link to those too (and make higher commission because they cost so much more). I am only sharing my honest opinion in this post. Margo – the “kickback” she’s getting is from Amazon…not from E-Cloths….no one is paying her for a “positive” review…the money comes from consumers clicking the Amazon link and purchasing from Amazon. If she linked it to a Norwex product she’d still get paid, but again from Amazon and not from Norwex. This was a fair answer. I am having a hard time bringing myself to spend 130 dollars on a mop. But the Norwex ecloth works so good that I am actually considering the purchase. I am now looking for alternatives and reviews before I dive in. I thank you for the time and opinion. I’m glad my post was helpful! Good luck with your decisions! A Norwex consultant wants to add to this discussion that Norwex is not allowed to be sold on Amazon and has no warranty if it is (and I will add that there is plenty of Norwex being sold on Amazon). I will not allow her actual comment because she included her Norwex business link. Hi! I came across your blogpost and wanted to give my perspective. I was the wife of a student for our first 10 years of marriage as my husband completed his Bachelor’s, Master’s and PhD. I learned to be frugal. When we finished, we had 3 children and $0 debt and we actually had even saved enough that we could put a down payment on a home in the California Bay Area. I know what it means to live on a budget. I also hated MLM and direct sales parties. Things did seem overpriced to me. I only ever attended to socialize and to eat the food. ? But I also learned that buying cheaper isn’t always better. Sometimes it’s worth saving up for something to get better quality, because it’s just a fact that some things are made better and that’s why they cost more. Certain things may not be worth it, but some things definitely are. My friend invited me to her online Norwex party and it seriously pained me when I made my first Norwex purchase of almost $100 and heaven forbid even paid shipping! (I NEVER paid shipping for anything.) The 60 day money back guarantee and the things that I saw in this party, told me it was worth giving it a try. So I did, and man was I in LOVE! I told my sister in law about them and also being super frugal, she researched and came across the e-cloth. She purchased it and was really enjoying it. So since it was super cheap on Amazon, I decided to try it as well. I decided to test it against the Norwex cloth side-by-side on my mirrors, windows, bathtub, marker stains on carpet, etc. What I found was that it took 3 times as long with the e-cloth to clean everything. Also, because the e-cloths don’t have the microsilver (the self-proclaimed expert you mentioned above did not use the cloths as directed) you would want to invest in way more e-cloths because you would need to get a new one at least every day. After factoring the costs of that, plus factoring in my time, it was clear that the wise choice would be to INVEST in more Norwex cloths. Since I’m super frugal I decided to host a party to help fill my home with the Norwex I wanted. And I did! I spent $200 that year on Norwex, but I ran my financial reports from Quicken and found that I had saved $300 on cleaning supplies from the previous year. 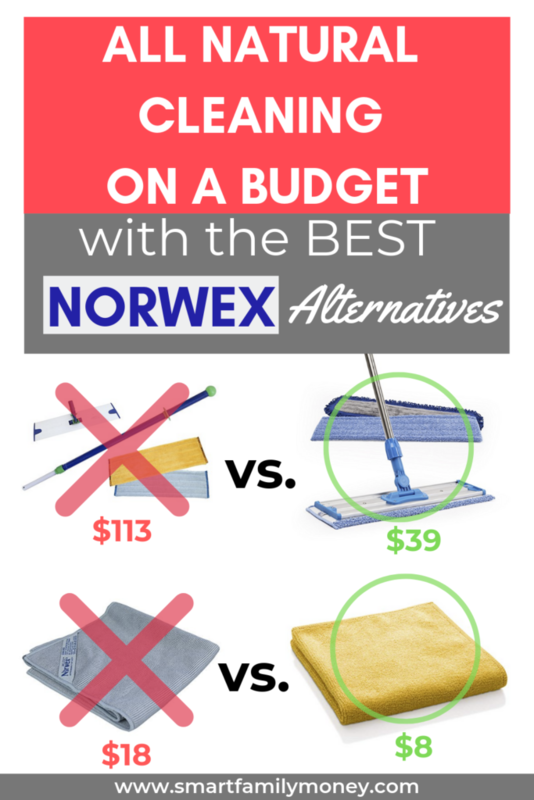 So if you are living on a budget, I would say that Norwex can definitely help cut costs! After this I decided I wanted everything in the catalog, so I signed up as a consultant to get the discount, another option for your readers. (My SIL has hosted 2 parties for me and LOVES her Norwex cloths much more than her e-cloths.) I think your readers would have been better served had you actually used the products they are trying to find a replacement for. If they know they are choosing to spend less money, but it will take them 3x as long to clean, maybe they would make a different choice or maybe they wouldn’t. I haven’t read your other posts, but I’m not inclined to trust anything you’ve written after reading this. If you would like to sample the Norwex cloths in order to properly review and compare, please don’t hesitate to reach out to me. I also am happy to share the independent testing Norwex had performed by an ISO lab (not a home kitchen). Thanks for your perspective. I have never spent $300 on cleaning supplies in a year and I am quite happy with my ecloths. I did test some Norwex and I didn’t think they were in any way worth 3-4x the cost. Hmmmm…I don’t think it is fair to discredit the author’s experience and opinion because it doesn’t align with your own. She fully states that Norwex is a great and quality product; without a shadow of a doubt. BUT, there’s also no denying that Norwex is a pricy item and not everyone who wants to have a chemical free home can afford it. It may be difficult for diehard Norwex fans and consultants to believe that there are alternative products on the market that are almost equal the quality and a great option…but in reality there are. If Norwex is what you have your heart set on, and you can squeeze it into your budget, great!! If not, it’s equally great to know there’s other options out there. Thank you, Cindy, for taking the time to put this review together…it must be tough (and not fun) to be pulled through the ringer, on your own website, for your personal views. I have done E-cloth and Norwex. 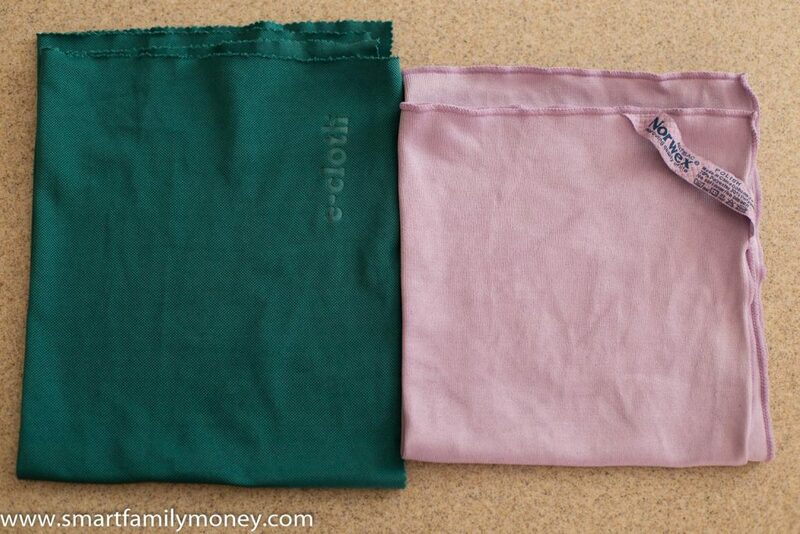 The only difference I see is the window cloth for Norwex is better. I need a new window cloth ( I clean houses so need a good cloth, no time to “double clean”) Other wise I see no reason to pay the extra for the other cloths . Wish I could find a cheaper cloth than Norwex that works as well. The link to your mop heads is not from ecloth. Are the ones listed the ones you tested? I have the norwex mop system, but am looking for a cheaper solution to adding more mop pads to my lot (I currently only have one wet mop head). Will the ones listed above fit the Norwex system as you said the ecloth system does? Have you heard of an alternative to Norwex’s Cleaning Paste? I have a consultant telling me that it will certainly get out some stains I have in my sink and bathtub, but $30 for the small container is hard to swallow. Unlike Norwex’s other products, this one won’t last years…it will run out the same as any other alternative. Well, e-cloth’s similar product is called “Universal Stone”. The per container price is about the same, but Universal Stone comes in a much bigger container. Norwex Paste is $29.99 for 6.7oz and Universal Stone is $29.95 on Amazon for 650g (22oz). So the cost per ounce is significantly lower. Here’s the link for Universal Stone: https://amzn.to/2D4kaoA. It’s not an all-natural product, but I really like Bar Keeper’s Friend for the jobs that the e-cloths can’t handle. If you’re interested, here’s the link to that: https://amzn.to/2D2sqW0 (available in grocery stores too). Have you found any good alternatives to the baby cloths that norwex sells? Thanks! Hi Carolyn! I don’t know of any microfiber cloths specifically for babies. There are a few microfiber face towels on Amazon but I don’t think that’s really what you are looking for. I have a friend who’s hooked on Norwex and sells the products to save money when buying for herself. I went to her first party so she could practice her presentation. I ended up with a free kitchen cloth which is great. I really like certain Norwex products because I can clean with water only. (I have allergies and sensitive skin.) BUT I agree, the company’s regular prices are just too high. (And who wants to splurge on cleaning supplies?!) So, I decided never to buy anything unless it was on sale or part of a “special” deal or if you get “free” items as part of a package. My friend also places several orders at a time and usually offers me free shipping. My niece sells thirty-one, and I do the same with her. It’s got to be something I really want, and I never pay regular price or shipping. Have you tried any of the ecloths? They really are great! Sounds like you have found some great deals on Norwex though! I think it’s important for people to use high quality microfiber cloths, but that it doesn’t necessarily have to be Norwex. Do you have any rule of thumb to know when it is a high quality towel? Hi Jordan. I wish I did have a good rule to tell if a cloth is good quality online, but I don’t. If you are checking it out in person, you can tell by feel. It should be thick, heavy, grippy (can feel it sticking to your fingers) and absorbent (if you can try it out). Thanks so much for this article! Do you know if there is an alternative for the Norwex Cleaning Paste and also the Entry Mat? Thanks again. I know that you aren’t supposed to wash microfiber rags with other laundry. But I’m not going to waste my time, energy, and detergent to wash 3 rags by themselves. So what happens when you do wash then with other laundry? Tony, what happens is that the cotton lint gets stuck to the microfiber and it makes them less effective. If you want to wash them with other things, I’d just try to avoid washing them with linty things like towels. If you could wash them with all polyester things, that would be best.